Really enjoyed last week's menu and hopefully when I weigh in later, I'll be able to report a loss because of it. The paprika pork was amazing and I'm having it again, but with chicken, if that makes sense. I'm cheating a little though. Last week I used the Sunday roast to make a couple of meals, which was very cost effective, so thought I'd do that again. So at the time of posting, I'll have already had the roast chicken! Hope you don't do me under the trades description act. Just realised it's all Syn free! Fabulous. Plenty left for snacks! And if you're wondering what tomato beef burgers are its a meal I've picked up somewhere. I'll post the recipe later this week, please check back. 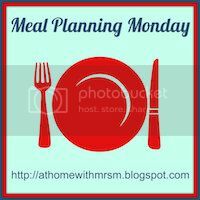 Don't forget to check out other meal plans with At Home with Mrs M. Click the badge at the top of the page to get yourself there. Update at 1500 YAY!!!!! 4lbs off. Last weeks plan really worked!